Not all supernovae are created equal, astronomers are finding. A faint supernovae found by international teams of scientists is like nothing previously seen, and cannot be explained by conventional insights into these exploding stars. Until now, only two basic kinds of supernovae had been observed. But now there appears to be a third. The first two types of supernova are either hot, young giants that go out in a violent display as they collapse under their own weight, or old, dense white dwarves that blow up in a thermonuclear explosion. White dwarf stars are composed mainly of carbon and oxygen, and although the supernova, SN2005E, appears to be from a white dwarf system, it is devoid of carbon and oxygen and instead is rich in helium. 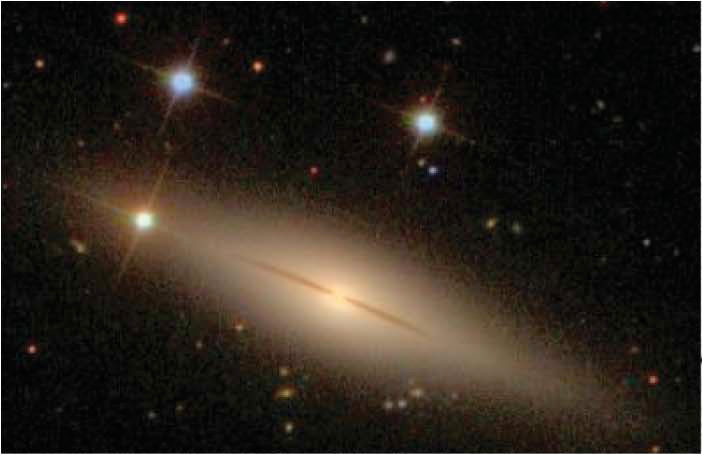 SN2005E was first spotted on January 13, 2005 in the nearby galaxy NGC1032, and since then scientists have carried out various observations of it using different telescopes. On the one hand, the amount of material hurled out from the supernova was too small for it to have come from an exploding giant. In addition, its location, distant from the busy hubs where new stars form, implied it was an older star that had had time to wander off from its birthplace. On the other hand, its chemical makeup didn’t match that commonly seen in the second type. SN 2005E had unusually high levels of the elements calcium and titanium, which are the products of a nuclear reaction involving helium, rather than carbon and oxygen. Computer simulations to see what kind of process could have produced such a result suggest that a pair of white dwarves are involved; one of them stealing helium from the other. When the thief star’s helium load rises past a certain point, the explosion occurs. “The donor star is probably completely destroyed in the process, but we’re not quite sure about the fate of the thief star,” said team member Avishay Gal-Yam. In fact, the astronomers say these relatively dim explosions might not be all that rare. Alex Filippenko from UC Berkeley professor and colleague Dovi Poznanski, both part of the team studying SN 2005E reported last November another supernova, SN 2002bj, that they believe exploded by a similar mechanism: ignition of a helium layer on a white dwarf. But this new type of supernova could explain some puzzling phenomena in the universe. For example, almost all the elements heavier than hydrogen and helium have been created in, and dispersed by supernovae; the new type could help explain the prevalence of calcium in both the universe and in our bodies. It might also account for observed concentrations of particles called positrons in the center of our galaxy. Positrons are identical to electrons, but with an opposite charge, and some have hypothesized that the decay of yet unseen ‘dark matter’ particles may be responsible for their presence. But one of the products of the new supernova is a radioactive form of titanium that, as it decays, emits positrons. Other researchers include: Iair Arcavi and Michael Kiewe of the Weizmann Institute’s Faculty of Physics, astronomers from the Scuola Normale Superiore, Pisa, and INAF/Padova Observatory in Italy, Prof. David Arnett from the University of Arizona, and researchers from across the USA, Canada, Chile and the UK. H.B. Perets, A. Gal-Yam, P. Mazzali et al., “A new type of stellar explosion from a helium rich progenitor,” Nature, 20 May 2010. A. Gal-Yam, P. Mazzali, E. O. Ofek, et al., “Supernova 2007bi was a pair-instability supernova explosion,” Nature, Vol. 462, p. 624-627, 3 December 2009. It seems that calcium and titanium abundances seen in galaxies like the Milky Way may be due to this novel method of production. Hopefully larger statistical databases of all types of supernovae, through LSST and the like, will shed light on the prevalence of this mechanism. Have you actually read these papers? Or are you promoting your web site by pretending to give some interesting links? As of now I am not sure the PAMELA and other data on positrons near the galactic center could be explained this way. The galaxy center e^+ are in the TeV range on average, which might be too high for this astrophysics to account for. Though it will be interesting to see how this might work out. Interested to see what turns out to be the progenitor here. Probably an unusual interacting companion star. Interesting research might come out of this. Thanks for the actual links iantresman.